Mr. Magoo & Betty Boop are heading toward each other. Mr. Magoo drives at 21 m/s and toots his horn (just for fun; he doesn’t actually see her). His horn sounds at 650 Hz. How fast should Betty drive so that she hears the horn at 750 Hz? Assume the speed o’ sound is 343 m/s. As we saw in the wave presentation, waves can passes through each other and combine via superposition. Sound is no exception. The pic shows two sets of wavefronts, each from a point source of sound. (The frequencies are the same here, but this is not required for interference.) Wherever constructive interference happens, a listener will here a louder sound. Loudness is diminished where destructive interference occurs. wavelength, destructive interference occurs. Example: Point C is 3.5  from the green center and 2  from the red center. 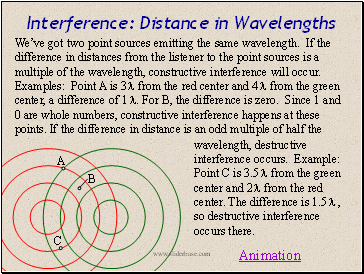 The difference is 1.5  , so destructive interference occurs there. Using the link below you can play the same tone from each of your two computer speakers. If they were visible, the wavefronts would look just as it did on the last slide, except they would be spheres instead of circles. You can experience the interference by leaning side to side from various places in the room. If you do this, you should hear the loudness fluctuate. This is because your head is moving through points of constructive interference (loud spots) and destructive interference (quiet regions, or “dead spots”). 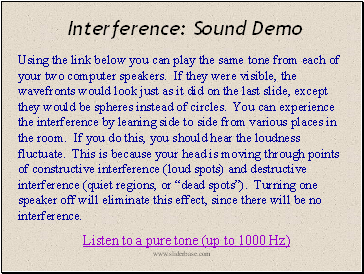 Turning one speaker off will eliminate this effect, since there will be no interference. 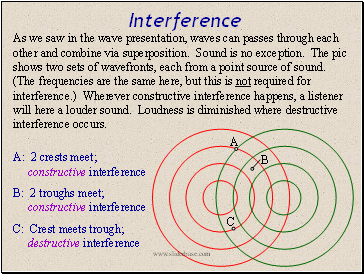 The concept of interference is used to reduce noise. For example, some pilots where special headphones that analyze engine noise and produce the inverse of those sounds. 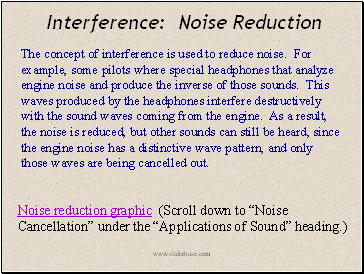 This waves produced by the headphones interfere destructively with the sound waves coming from the engine. As a result, the noise is reduced, but other sounds can still be heard, since the engine noise has a distinctive wave pattern, and only those waves are being cancelled out.